At Burma Camp? Still, No Sir!!!! In that article, I suggested that instead of burying our national heroes like Vice-President Amissah Arthur, Senior Minister J.H. Mensah in unmarked graves at exclusive Military Cemetery at Burma Camp, they should rather create a new separate reserved ‘National Heroes Acre’ or simply renovate President Mills’ Asomdwee Park and make it a special burial centre for national heroes. That Wednesday morning, I was speeding along the Accra – Cape Coast Highway going to Cape Coast High Court when my mobile phone rang, and guess who was at the other end – Lieutenant General Obed Akwa, Chief of Defence Staff!!!!!!! “Nkrabeah, we need to talk about your article in today’s DAILY GUIDE”………. He went on and on. I was speeding almost late to court, and the network was not the best. Besides, the General was becoming difficult, so I said, “General, I will be at the military burial of Lt Col. Mensah Gbedemah tomorrow”. “Ah! Excellent! I will show you the new military cemetery”, he responded. The next day, we all met at the Catholic Church of the soldiers at Burma Camp for the burial service for the late Lt Col. Mensah Gbedemah, intake 7. It was a burial service with a difference. There were brochures alright, but no biography, no tribute whatsoever. Nobody said a word about the life of the deceased – none whatsoever – his age, his family, his education – nothing at all. You could only guess who he was from the roll call of the congregation: Intake 7 of the Ghana Military Academy, including the famous Lt General SK Obeng, Army Commander and CDS for nearly a decade; then free masons, dressed in black suit, then Old Achimotans (1962 Year Group) including ninoes like me, who sang the school hymn and only the current Command of the Armed Forces led by General Obed Akwa, Chief of Defence Staff. During announcements, a family member said it was the wish of the deceased that there should be no tribute or biography about him at his funeral. I could not help laughing when a colleague senior lawyer told me afterwards that he too wants to legislate “something queer” about his funeral – Effah, can you suggest something? Maybe you should be buried in an open coffin or possibly standing in the grave………..
From there, we all drove behind the Burma Camp barracks under the Air Force runway and entered the new Military Cemetery – a vast walled about two acres of land, extremely very neat. General Akwa saw me, and like friends of old when we were both lieutenants at Michel Camp Tema in 1979, he held me by the left hand, close to his chest and gave me a quick pictorial vision of the new Military Cemetery……. 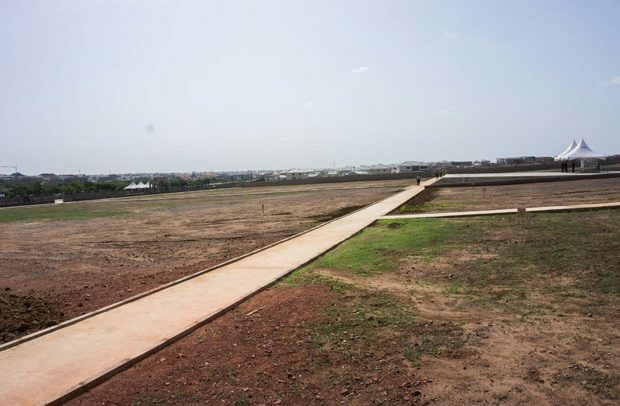 Go to Kwame Nkrumah Memorial Park – you will see the clear outline of the grave of President Nkrumah. Go to Gwollu Upper West – and you will see the clear tomb of former President Limann; go to Asomdwee Park – you will see the clear outline of former President Mills. In fact, go to EVERY CEMETERY in Ghana and you will see the clear tombs of fallen people – graves clearly marked by their loved ones. At Jinjini, my sister’s grave is there for all to see. BUT, GO TO BURMA CAMP – New Military Cemetery, and there is NO SIGN that this area is reserved for VVIP, and what is more, the grave of Vice Pee is marked only by a gold plated tombstone, otherwise you will not know whether you are standing directly on his grave. How? I saw J.H. Mensah’s grave looking fresh, with wreaths on it. After about two weeks, the wreaths will disappear, and only the tombstone will remain – the spot will look the same as the whole park. Reader, this is my point. I repeat, let us rather wall Asomdwee Park, build a royal entrance, place full military guard there, as National Heroes like Kofi Annan can be buried there, clearly marked, in perpetuity, as holy burial ground. How much will it cost to build a National Heroes Acres? One hundred million dollars? Is it even too much money to create a national iconic centre, which will always inspire the youth and upcoming generations to sacrifice and work for our Motherland? There are three things every ambitious mortal craves for: POWER, which is nothing if you don’t have WEALTH which is vanity unless you have everlasting FAME. Go to Kumasi – Otumfuo Osei Tutu has erected a larger than life-size physical statue of himself at Airport Roundabout – for all eternity. Let us build a lasting sacred special National Heroes Acre and reserve it for outstanding national heroes for all time. As for VVIP at Burma Camp, No Sir!!!!!! Please don’t send the UN Secretary-General to lie among Corporals and Majors. At worst, take him to the Royal Mausoleum at Akwamufie in the Eastern Region.